Kelly House is a four story an apartment complex at the corner of St. Philip and Vanderhorst Streets. Constructed in 1995 with an anticipated refresh in the summer of 2018 Kelly house features a central courtyard and central laundry room located on the 1st floor. Kelly House is arranged with all apartments opening to outside corridors. Townhouse apartments are shared by 5 residents and consist of 4 bedrooms, 2 bathrooms and 1 living room with full kitchen including a stove, microwave, sink, and full-size refrigerator. Single-level apartments are shared by 2-6 residents and consist of 2-3 bedrooms and 1-2 bathrooms. Kelly House is air-conditioned, has IPTV, WiFi, and 24-hour information/security desk. Room dimensions vary according to specific location, but typical townhouse private bedrooms measure 9’ wide x 10’ long. Typical townhouse double bedrooms measure 11’ wide x 12’ long. Typical single-level double bedrooms measure 8’ wide x 12’ long or 11’ wide x 11’ long. Wood frame beds, 36” wide x 80" long. 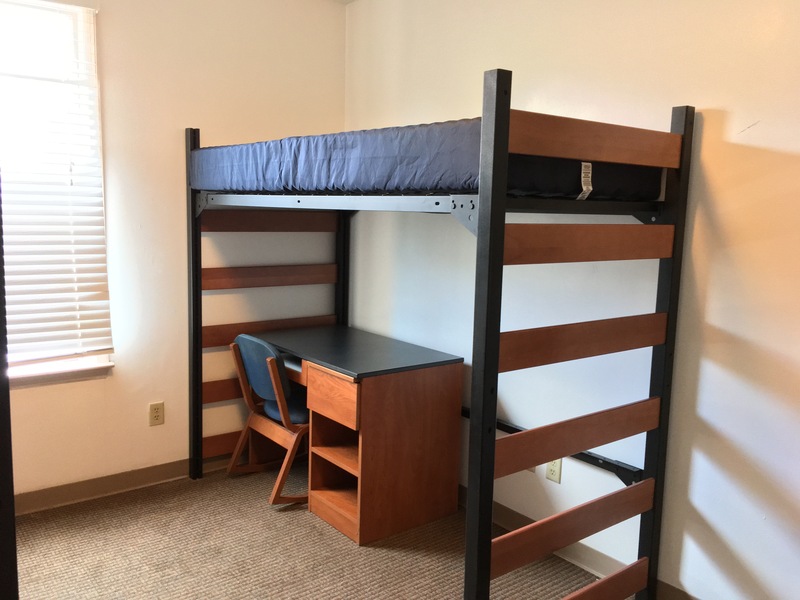 Beds are lofted in double rooms and semi-lofted in single rooms. Please note these mattresses accept only "twin-long" sheets. Desk with black top and cherry finish, 42” wide x 24” deep x 30” high and a desk chair. Built in closet, sizes vary depending on room. One window, varying in dimension according to apartment. Average window size is approximately 33” wide x 70” high. All windows are covered by 1” aluminum mini-blinds. We do not allow wall or frame fastened curtain rods, but students may drape fabric from the valance of the blinds. Meet the Kelly House Staff!